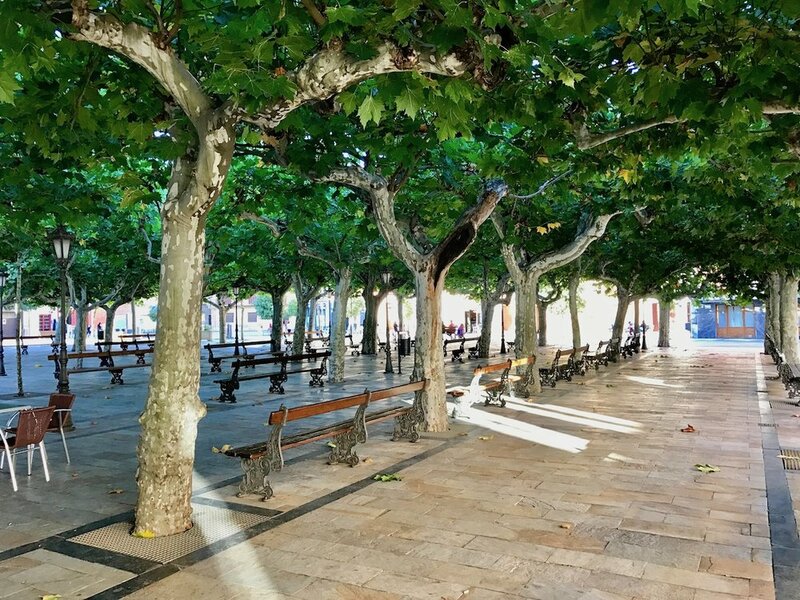 We found Bodegas Marqués de Tomares up from quiet narrow streets lined with trees, under the bluest of skies just outside the town of Fuemayor in La Rioja, Spain. Wine is in the air here, one of those places where the bodegas seem more numerous than houses, whose road to town was painted with the fall oranges and reds of grapevines of a harvest just concluded. We've come to the epicenter of Rioja, one of the world's most famed and storied wine regions -- one of Spain's only two regions to share the Denominación de Origen Calificada (DOC) -- whose 600 wineries produce some of the finest Tempranillo on the planet alongside smaller varieties such as Graciano, Mazuelo, Garnacha. Though very unique whites are made in this region, Rioja is known for its Old World reds produced mostly from Tempranillo. True to form, Tempranillo accounts for about 90% of what Marqués de Tomares grows on their 200 hectares, though they do achieve larger scale producing wines here from grapes grown elsewhere in Spain. At 2,000,000 bottles per year, the bodega is in fact by far the largest of the wineries we've recently highlighted in Spain's Rioja, Ribera del Duero, and Toro regions, though it has nonetheless been passed through successive generations since its founding in 1886. Their Cava sparkling wine is popular in Brazil, and much of their wine is imported to the United States bearing the label Viña Otano. We eventually made our way to to the winery's lovely rustic tasting room with our host, Sara, who paired various meats and cheeses with a bottle of their 2015 Nuestro Verdejo from, interestingly, the Rueda region (for context, a bit shy of three hours southwest of Fuenmayor, past Burgos and Valladolid towards Portugal). This was delightful, as Rueda is a wonderful producer of white wines, and the Verdejo grape in particular. The real culinary highlight followed down in Fuenmayor at Restaurante Alameda, a charming yet unassuming facade behind which we found a delightful bright dining room in which we enjoyed one of the most spectacular gourmet lunches we can remember. Tomares and Alameda together paired soup, Norwegian lobster and chickpeas, beautiful salad, and -- we're going to walk out on this limb -- best croquetas we've had in all of Spain with, of course, a delightful bottle of the Marqués de Tomares Reserva from a vintage year that remains a mystery to us because the bottle bore no label. Marqués de Tomares wine is imported in the United States by Grapes of Spain, available in the Washington, DC area through The Vineyard of McLean (1445 Laughlin Ave, McLean, VA), in New York at Penn Wine and Spirits in Penn Station, and (we believe) in the Boston area through Blanchard's in West Roxbury, Jamaica Plain, Revere, Marshfield, and Hyannis. Grapes of Spain's website offers complete distributor information across the United States. 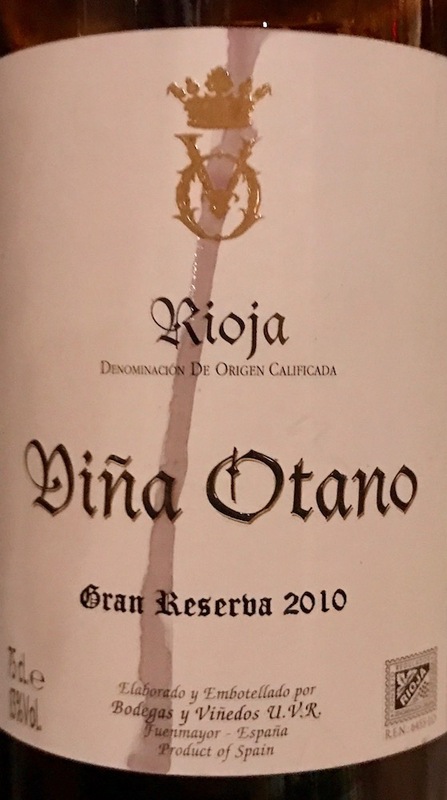 We also recommend trying the Viña Otano Gran Reserva at Joselito - Casa de Comidas, an excellent Spanish restaurant in Washington, DC. Characteristic Verdejo from Rueda, the Nuestro ("our" in Spanish) was dominated by immensely floral notes. Flowers and juicy grapefruit were followed by lemon zest on the palate and a quite refreshingly light acidity that nonetheless felt like we were drinking a flower (see a theme here?). It turned pleasantly sweet at the end, and paired very well with Manchego cheese. Served alongside a phenomenal lunch at Restaurante Alameda in Fuenmayor, the signature Reserva seemed more tannic in the nose than it proved to be, with elements that could lead one to mistake it for a highly robust Pinot Noir from Oregon alongside the hint of delightful blueberry that is telltale Ribera del Duero, not necessarily the Rioja that we had in our hands. The palate gives way to a sweeter black cherry joice with a hint of iron, and continues to grow and mature very well with every moment the bottle is open. Deep garnet color in the glass makes this an absolutely strikingly beautiful wine. Warm red cherry combines interestingly with a little evergreen pine element and a bit of fine cocoa dust in the nose. We found the 2009 to still be a little tight on first opening, even after eight years, with dry tannins and an austere, chalky minerality that exudes sophistication. This bottle smoothed dramatically after about an hour exposed to air, after which cherry and cranberry notes began to assert themselves in what had hitherto not been a significantly fruit-driven bottle; we definitely recommend decanting. The Reserva wants to be paired with food. This wine is given the Gran Reserva designation to note its lengthy time in barrel and bottle. It's made interesting as a blend of 80% Tempranillo, 15% Graciano, and 5% Mazuelo. An active nose greets you with a little sweet fruit when you swirl in the glass. Fruity and earthy with a hint of blueberry, the wine was served slightly chilled and runs very cleanly across the palate. The chilling brought out some red fruit that may otherwise been buried. There is less wood element than you'd expect, but the the glass does feature some lovely cedar on the palate.